We lost the use of our kitchen sink on New Year’s Eve. At first it was just slow draining, then it worked a bit. Then, right after the shrimp scampi pan was washed out in the disposal side, it gave up. Apparently there was a lot of foolishness in the plumbing below the house, and the serious plumbers felt that it needed to be re-done. Well, let me tell you: take a moment, and go bless your kitchen sink. After four days without one, I am ready to write sonnets for it. Four days of dirty dishes in the dishwasher, crumbs on the counter requiring a trip off to the bathroom (!) to fix. We bought paper goods. I still didn’t know what to do with leftover cereal. The toilet? I just went with a garbage bag. 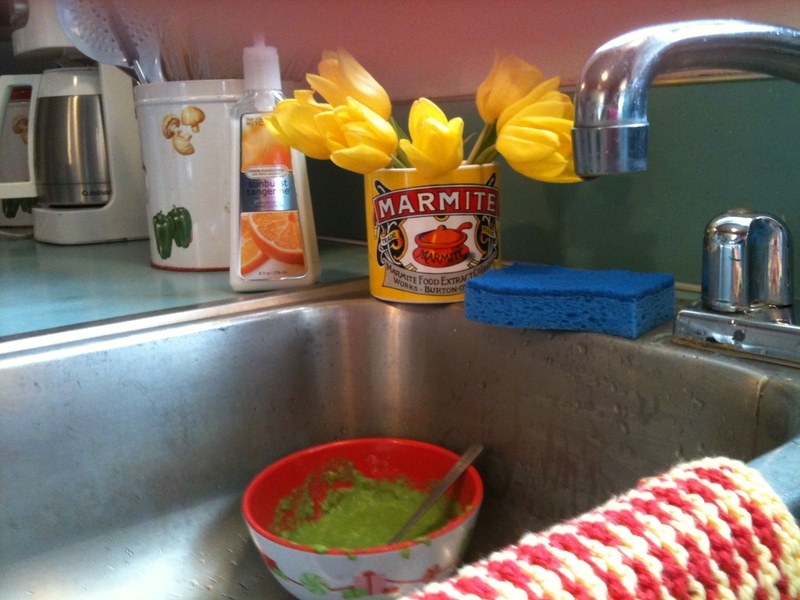 I couldn’t bring myself to wash dishes in the bathtub – yucky on so many levels. So we just held on. Our poor sink was shrouded in a garbage bag. It smelled! We have had this happen. . .I AGREE! 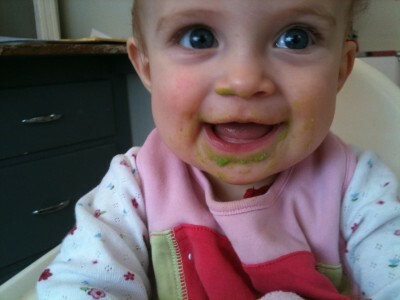 Cute green pea face, there. What a smile! Oh, I’m happy for you! (I don’t have a disposal right now, but if we ever move into town that would be almost my favorite thing.) It looks wonderful now! It is wonderful to have that simple luxury of running water! We live in a house with a shallow well, and sometimes it dries up. It’s easily re-filled, unless it happens on a holiday weekend or Sunday. On those occasions, the lack of running water anywhere in the house gives us all a renewed appreciation for something that we would otherwise consider just BASIC decent living conditions. We lived in Arequipa, Peru for four months. The water would be turned off to the WHOLE city of 1 million people for up to three days at a time. Now back in the States, every time I take a shower I thank the Lord for water, hot water, clean water, and lots of water! Love the Marmite can with the flowers. I agree! That happened to us once about one hour after Christmas dinner (when we went to do the dishes)–and calling a plumber on Christmas weekend is 5x more expensive, so we had to wait 3 days! Bleh. I, too, have felt your pain. And I have also felt your relief. ( http://t.co/xdWOTOn ) Functional plumbing is definitely a thing of beauty and a joy forever. We currently are suffering from this difficulty! I’ve been remedying the situation with basins for dish washing and collecting excess water. I will be so thankful when the kitchen sink can resume normal operations again.